Valtsu's: Hypothyroidism: Could it be treated with LIGHT? One of the most popular articles of my blog has been about the therapeutic effects red and near-infrared light. An edited version the article has also been published at Perfect Health Diet blog. The treatment is officially called photobiomodulation (PBM). It was previously called low-level laser therapy (LLLT), because most of the research was conducted with laser light sources. Nowadays it is considered proven that the positive effects of red and near-infrared light do not require lasers, and therefore many photobiomodulation research groups are currently using LEDs. size varies a lot (1mm2 - 32cm2) in different studies. Photobiomodulation (PBM) is based on the research showing that red light and near-infrared radiation can boost cellular energy metabolism by activating the enzyme complex called cytochrome c oxidase. This energy-boosting effect can apparently protect tissues from stress and inflammation. Many interesting results have been published regarding the treatment of hypothyroidism with PBM. Here's my short summary of the results. 1) In a Brazilian pilot study (2010), 47% of the hypothyroid patients receiving 10 treatment sessions of PBM with near-infrared laser light maintained normal thyroid hormone levels without thyroid medication (levothyroxine; LT4) at the end of the 9-month follow-up. Other benefits were also noted: TPOAb levels decreased by 39%, echogenicity index (EI) increased by 22% and normalization of thyroid volume was noted in three of the seven patients with abnormal thyroid volume. 2) In a Brazilian randomized controlled trial (2013), 48% of the hypothyroid patients receiving 10 sessions of PBM maintained normal thyroid hormone levels without thyroid medication at the end of the 9-month follow-up. Other benefits were also noted: TPOAb levels decreased by 49%, echogenicity index (EI) increased by 19% and normalization of thyroid volume was noted in five of the seven patients with abnormal thyroid volume. Thyroid vascularization was corrected in 16 of 22 patients who had abnormal vascularization at the baseline. 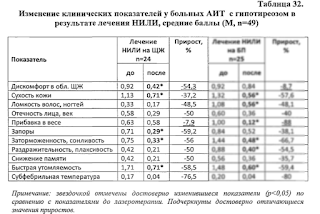 3) In an Ukrainian dissertation study by Viktor Dubovik (2003), it was concluded that PBM can decrease medication requirements by 50-75% in people with postsurgical hypothyroidism. 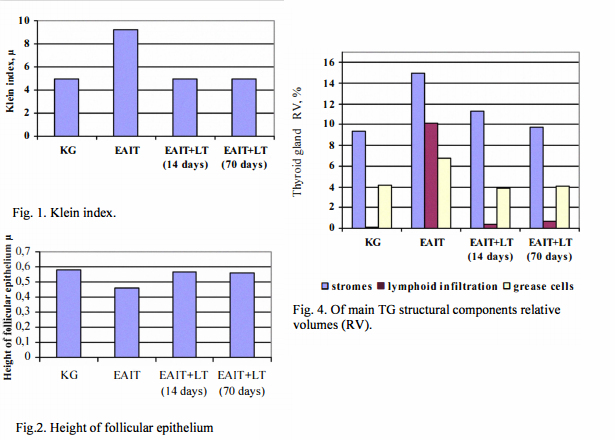 Antibodies for Tg and TPO were decreased after the treatment. 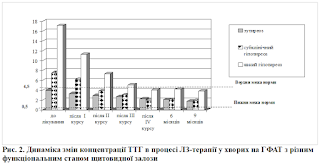 4) Another Ukrainian study by Yulia Buldygina (2002) concluded that PBM might be beneficial for hypertrophic forms of autoimmune thyroiditis. In this study, they utilized a red light (633 and 850 nm) from a laser device. In this long-term study, they treated patients with euthyroid, subclinically hypothyroid and clinically hypothyroid hormone levels. In all groups, the decrease in TSH and TgAb was remarkable. courses (each course included 10-15 treatment sessions). 5) Ukrainian study by Katerina Misura (2006) showed that PBM can improve the treatment results in hypothyroid patients who also suffer from cardiovascular disease. These patients don't usually take adequate amounts of oral thyroxine, because of the possibility of severe cardiovascular symptoms. Both groups received various drugs including levothyroxine, lovastatin and aspirin, but intervention group also received PBM treatment. In this group, significant improvements in thyroid hormone and cholesterol levels were observed. In PBM group, TSH decreased 53% and T4 increased 95% in 3 months. In the control group, the hormone concentrations remained unchanged. 3 months. In the control group, the decrease was much less pronounced (8.20 -> 7.67). 6) In a Russian dissertation study (2010), 17% of the hypothyroid patients receiving PBM on the thyroid area could discontinue thyroid medication, and 38% could decrease the dose by 25-50µg. effect on thyroid antibodies (TPO, Tg). 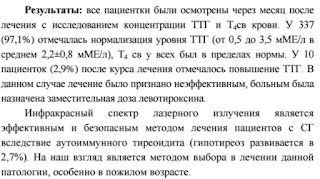 7) In an Russian report (2014), the treatment of 347 subclinically hypothyroid women was described. Their baseline TSH averaged at 9.1 mIU/L, but after ten sessions of PBM, the TSH was normalized in 337 (97%) of these women. Their TSH averaged at 2.2 mIU/L after the PBM treatments. of the pathology, especially in the elderly." 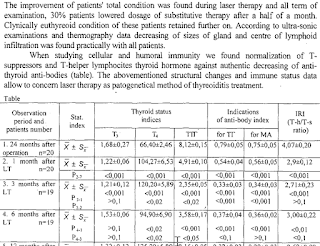 8) A Russian study by Alexander Poljakov (1997) includes some data of chronic autoimmune thyroiditis patients who underwent a thyroid surgery. Photobiomodulation (PBM) with near-infrared light (890 nm) from a laser source was found to improve thyroid hormone levels of these patients. It was also mentioned that the patients treated with PBM require half as much thyroxine as usually. tended to decrease in the "standard treatment" group. 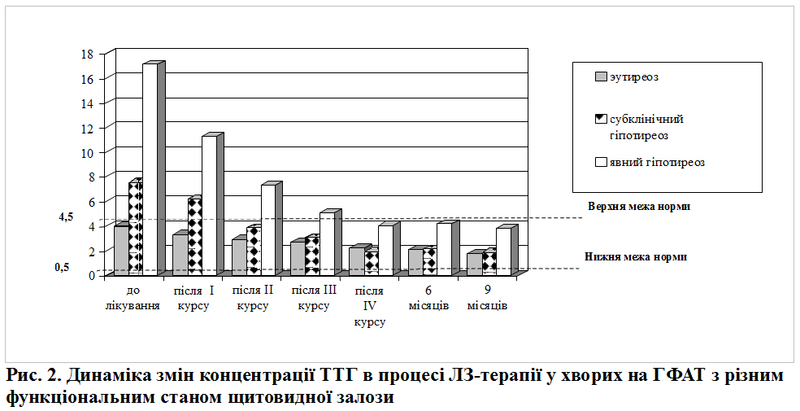 9) Ukrainian researchers also conducted an animal study, in which they they induced experimental autoimmune thyroiditis to rabbits (n=40). 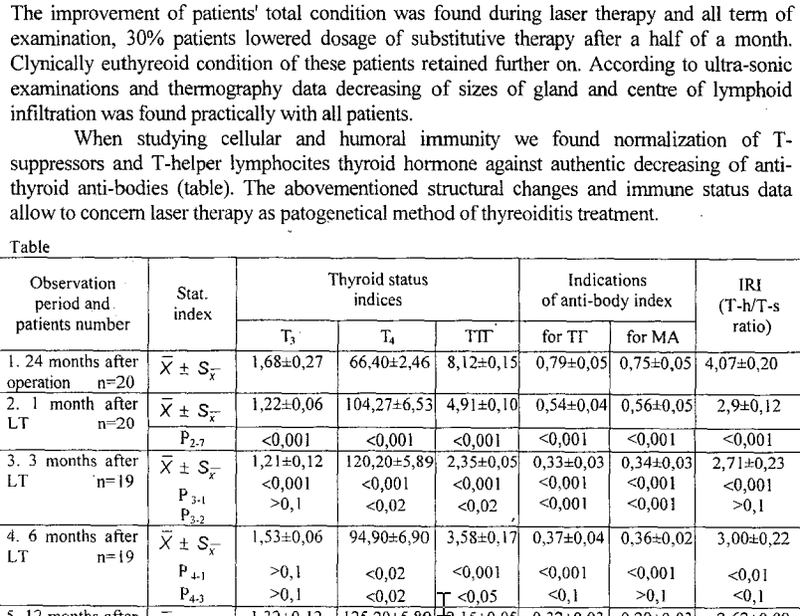 Apparently, photobiomodulation (PBM) reversed most of the thyroiditis-associated changes to the thyroid tissue. I would say these results are very impressive. I'm not aware of any other treatment that could improve several markers related to hypothyroidism and even allow some patients to discontinue their thyroid medication. This would make PBM (previously "LLLT") a very appealing future treatment to hypothyroid patients. Since ~400 papers on PBM are being published annually, I guess that it won't take many years until we know much more about possibilities in the use of light in the treatment of hypothyroidism and many other diseases. 4. Addendum: How can we apply these results in real life? These photobiomodulation (PBM) studies were all conducted with a laser device (Thera Lase in Brazil; Mustang 2000 in Russia/Ukraine). The usage of lasers has been very common in PBM, which was previously called low-level laser (light) therapy (LLLT). However, the current evidence suggests that laser lights are not required for photobiomodulation. in other words, LED lights can be used for photobiomodulation as well. Preliminary evidence also suggests that even the typical sources of broadband light (eg. halogen lamps, incandescent lamps, heat lamps) might work for photobiomodulation (Heiskanen&Hamblin 2018). Actually, 110 years ago there were some books that recommended the light of incandescent bulbs in the treatment of various diseases such as obesity, diabetes, balding and chronic fatigue. The authors of those books understood it's the red/infrared part of the light that is responsible for these beneficial health effects. As a conclusion, I would say that it's possible that red and near-infrared LEDs and even ordinary incandescent/heat/halogen bulbs could have these beneficial effects since they emit the right wavelengths (red light and near-infrared). However, as I've explained in my comprehensive article about PBM, I think one needs to be careful about the dosing, as photobiomodulation is characterized by the biphasic dose response, where either too little or too much light might be ineffective. ISRN Endocrinol. 2012;2012:126720. Assessment of the effects of low-level laser therapy on the thyroid vascularization of patients with autoimmune hypothyroidism by color Doppler ultrasound. Höfling DB, Chavantes MC, Juliano AG, Cerri GG, Knobel M, Yoshimura EM, Chammas MC. Buldygina Y. Possibilities of low-intensive laser radiation in treatment of hypertrophic form of autoimmune thyroiditis. – Manuscript. Dissertation for degree of candidate of medical science by speciality 14.01.14 – endocrinology. – V.P. Komissarenko Institute of Endocrinology and Metabolism of AMS Ukraine, Kiev, 2002. Misura E.V. A complex method for treating patients with autoimmune thyroiditis in presence of hypothyroidism and accompanying coronary disease. - Manuscript. The dissertation competing for a scientific degree of Candidate of Medical Science in specialty 14.01.14 – Endocrinology. V. Danilevsky Institute of Endocrine Pathology Problems of the Academy of Medical Sciences of Ukraine, Kharkov, 2006. Do you think these results and conclusions are adabtable to benefits of infrared saunas? Infrared saunas don't usually emit near-infrared wavelengths. So I guess they are not. Logic says that IR saunas should also work, as the spectrum from the incadescent light they use, includes the beneficial 800 - 950nm near-IR spectrum. The IR spectrum can penetrate up to 50mm into the flesh. Lessor wavelengths such as red 650nm can do but not as well. Dr Tiina Karu says there is some extra benefit from monochomatic light (i.e. single wavelength), such as exactly 630nm or exactly 830nm, rather than the multi spectrum white light from an IR sauna. I once read somewhere that the ancient Egyptians figures out how to break sunlight into it's individual color componenets and use those colors to treat patients. I think most IR saunas use heaters, which usually emit longer wavelengths than incandescent lamps. I looked at different IR saunas in my country, and none of them emitted shorter wavelengths than 1400nm. I think some of them emitted 5 000 - 1 000 000 nm infrared. Thank you for this, I've been really curious about the subject from some of the studies you've posted. Was the English translation of that study costly? You could set up a Patreon or something to let people support your work. 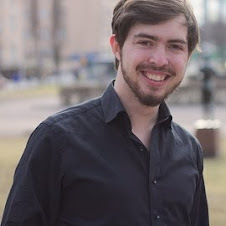 I had 70-80% of the Dubovik article translated for 50 dollars at Fiverr. It's usually $5 per 300-500 words. And some of those articles/'autoreferats'/dissertations have thousands of words so I think the total money needed to translate all of that stuff to English would be 400-500 dollars. Thanks for the great work. I have been using this successfully with myself and others for a few months now in my practice. It is certainly nice to have a succinctly organized resource to point my athletes and prospective clients to. Thanks for your time. Nice to hear that you've used light therapy successfully. It'd be also interesting to know what type of lamps you are using. Thank you and Tom Brimeyer for bringing this to the forefront of my fellow Hashimoto's sufferers. I'm very encouraged by this. To date, the most effective drop I've had in my TPO antibodies was with Wobenzym PS systemic enzymes over a 3 month span. I'd rather do this than take those expensive supplements. Hi Unknown, and thanks for the comment! I've seen a study abstract regarding Wobenzym and Hashimoto's. It also seemed promising. 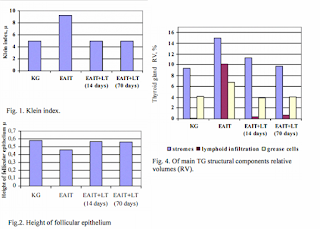 But this LLLT stuff is certainly the most interesting approach to thyroiditis. Do you recommend nir for teeth/gum infection? If yes, which device? Since mouth epithelium, gingiva and teeth are quite superficial, even visible red light might have a positive effect. Therefore, you don't necessarily need NIR. There is no guarantee it works, since many studies with varying wavelengths/power/dose/pulsing/etc have failed. But it's still cheap, generally safe and probably worth a try. Great Article Valstu. thanks for the effort. Thank you for this information! I just have one question: To try and replicate these effects, should I do 10 treatments every nine months? I think it might be good. If you look at the results of Buldygina, the additional treatments seemed to bring additional benefits. Do you recommend any good lllt to buy. One of the promising products is B-Cure. It's portable laser device with 808nm wavelength. However, it's a little bit expensive, ~700 euros in my country. Some people claim positive effects from 400-700W halogen lamps you can buy cheaply from department stores (20-30 euros). They might be worth a try. Expensive but cheap if it can someone with thyroid issues. Do you know anyone that has tried this? Great info and thanks for bringing this up. Unfortunately, I don't know anybody yet. :\ I hope some people will try it and measure if their thyroid hormone levels improve after LLLT. I might try this. Do you know what frequencies were used? How long the laser was over the thyroid? And how often they did the treatments in these studies? I am unlucky in that I am hypothyroid but I cannot tolerate any forms of thyroid treatment. It is winter here and I am cold. By frequencies, do you refer to wavelength? In the Brazilian studies, they used 810nm. 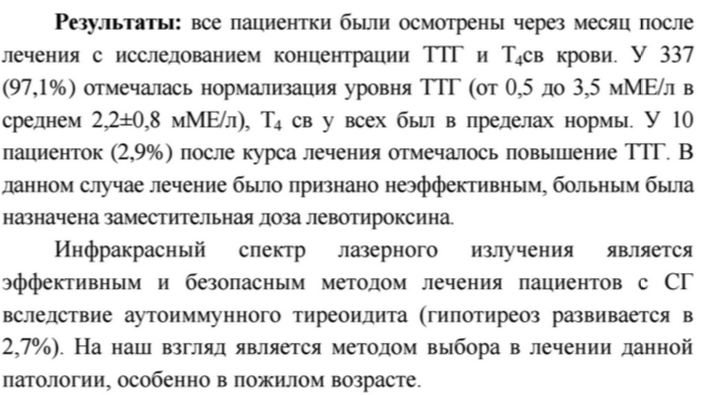 In some of the Russian/Ukrainian studies, they used 890nm if I remember correctly. 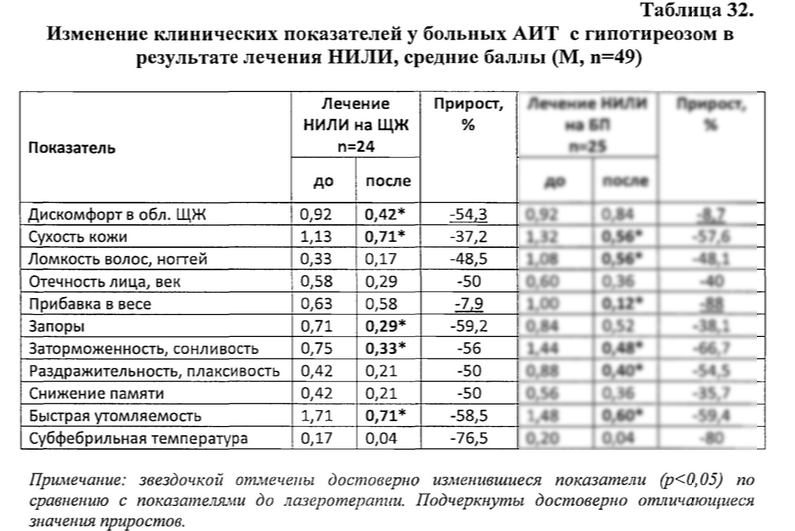 In one Ukrainian study they also used 634nm and 850nm, but I think that red light (634nm) might not be effective because it doesn't penetrate well through the skin. In Brazilian study, the dose was "2 joules per point", and I have the belief they irradiated approximately 20 points, so the total dose would be 40J. The irradiation time would depend on the output power of the device, but for example, if you had a 100mW device, the irradiation time would be 400 seconds. If you use device with continous spectrum (eg. incandescent lamp), then a significantly higher dose might be needed, because most of the wavelengths are non-terapeutic. I think there were 10 treatments during 5 weeks in the Brazilian studies. Yes I did mean frequencies. Forgive my questions as I am new to this area. What is meant by irradiation? Also I looked up the device you mentioned but it did not list a price. I live in North america. I am reading a book and you might have interest in a specific chapter. It is called the brains way of healing by Norman doidge. I am reading a chapter on how light heals and thus far it is mind blowing to me. There are many perceived health benefits associated with infrared heating and ceramic heaters Not only do they provide efficiencies but they are also great for a range of ailments. Great article- thanks! Interesting article thanks for sharing! There are found to be a range of ailments including arthritis that can be healed by using infrared heaters. Did any of the studies mention any side effects? Mine is missing the "spacer unit." Is there any danger to using such a device on the thyroid area (or a danger to the eyes from looking at the unit when it's on and lit up)? Thanks! I haven't heard about any dangers regarding LLLT and thyroid gland. Eyes can be injured from LLLT, but the intensity coming from this device is probably very safe, especially if the distance between the device and the eyes is more than 5 centimetres. Regarding this device, it seems decent, though I have a suspicion that it could be a little bit "underpowered". Since the average power is 8mW and the beam area at focus is 2cm2, it might be that the power density at focus is only 4mW/cm2 instead of the "20mW/cm2" mentioned in the manual. That is quite a low intensity, and might not be very efficious for treating a gland that lies under some skin layers. I would probably use it for at least 5-15 minutes per session to increase the chance of getting a sufficient dose. Hi Valtsu. I live in European Union, can you please recommend something that can be used in Europe? I know there is some differences for electric devices. Thank you. I would guess that some LED-based devices sold by Red Light Man could be fine. For example, Infrared Mini 830. It costs about 85€. Lasers are a little bit more expensive, and I think there should be a little bit more variety. Some products that could be useful are B-Cure Laser and Treatlive Active. They probably cost 600-800€. Can you please tell me: the Red Light Man device, can be used for thyroid, specifically Hashimot's? Hi there...another blogger talking about the benefits of red light on the thyroid gland had this to say...."Using a light treatment operating at wavelengths lower than 600 nm wavelengths may not result in desirable result, similarly, using a LED light device operating above 800 nm may cause severe problems to your thyroid, and therefore, it is important to get advice and recommendation from patients and doctors before you decide on which product to use. The higher wavelengths are normally recommended for the worst case situations." This is the only thing I've read about higher wavelengths being possibly harmful, why would she say this. Is there ant merit to it? (1) Lower wavelengths that 600nm would be either green or blue light. Those wavelengths do not penetrate tissue and they also don't have the same effect as red light or near-infrared light. (2) Some of the studies I'm referring to have been using wavelength above 800nm. For example, the Brazilian studies with positive results. They did not use LED but laser light, but some of the best researchers have been saying that LED light's effects don't really differ from laser. --> I don't personally believe that wavelengths in the 800-900nm range would be a problem. Did that hofling study produce an update to the study in 2017? I'm struggling to find it. I see the clinical trials page says last updated 2017 but I can't actually see an update and there's nothing on pubmed. Thanks! They published a 6-year follow-up as a conference abstract. I posted it to my LLLT Facebook group (the one with 2000 members) several months ago. They reported that only some of the positive changes remained after 6 years, so the LLLT treatment should be repeated occasionally. I would like to try it for my Hashimotos, but it is pricey at approx. $1.000 US Dollars. Yes, my guess is that Joovv is quite a good LED light. However, it is quite expensive. That's why I prefer webstores like Red Light Man. just ordered the mini combo lamp from them with the same treatment intention- i have hashimotos and want to primarily use it on my thyroid. hopefully will see some improvements. "A continuous wave (CW) diode laser (GaAlAs—830 nm) with a beam area of 0.02827 cm2 (Thera Lase(TM), DMC, Sao Carlos-SP, Brazil) was used"
Maybe you can contact the company or somebody from the research group to give more information about the device.